Attention No Glass Allowed In Pool Area Sign - 12x18 - Rugged rust-free aluminum signs for indoor or outdoor use. Made of heavy-gauge reflective aluminum with anti-weather and anti-graffiti protection Available. Prevent guests or residents from using glassware around your pool areas with our indoor/outdoor rated heavy gauge durable aluminum signs. Broken glass can be extremely dangerous and can cause severe injury to those walking barefoot around the pool area. Even worse, clear broken glass inside the pool can be virtually undetectable. It would require the pool to be closed down and pool water to be completely drained in order to locate and remove the broken glass. 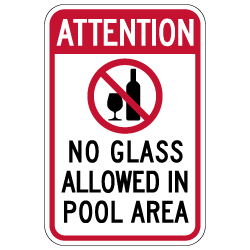 Having No Glass Allowed In Pool Area signage is essential to good property management. With our eye-catching sign designs you can clearly state your pool regulations and help prevent future accidents and injuries occurring on your property. DOUBLE the working life of your No Glass Allowed In Pool Area Signs by adding 3M Protective Overlay Film (POF)! 3M’s high-tech POF protects sign faces against fading caused by the sun and harsh weather—and makes graffiti and sticker defacement damage easy to clear away without harsh abrasives.